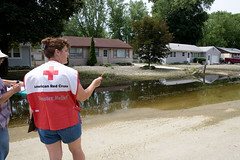 We were out today assessing damage in flooded areas of the Rock River. In some areas front yards had actual fish living in ditches. Others needed boats to access their homes. Check out more photos on our flickr page.